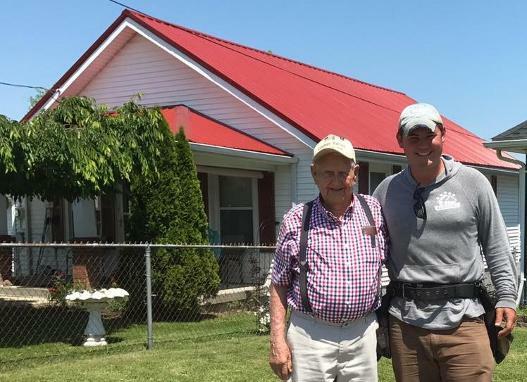 Coleman Hatton, a World War II Veteran who is Gayle's Dad along with Ollie Rowe, owner of 5 Star Roofing. Most wonderful friendliest people you could meet! Very efficient and fast at their job! Great great job done for my dad and me!!! Ollie and his crew showed up right on time. They installed a metal roof on our garage and it has never looked better! They were all courteous and very professional. Everything was as neat and clean when they left as it was when they arrived. If you need any roofing done, call 5-Star. We'll be calling them again! 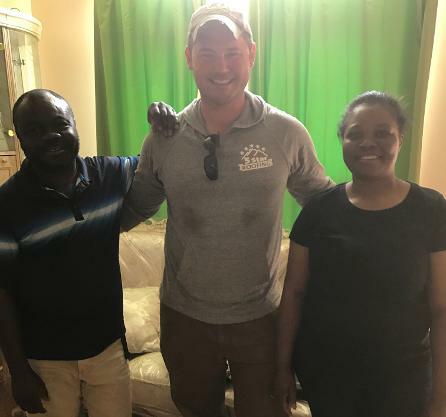 Ollie and his crew were professional, efficient, and installed a beautiful metal roof within the time frame promised, at a competitive price. I highly recommend 5 Star Roofing! I wouldn't call anyone else. Were it possible, I would give 5-Star Roofing and Ollie Rowe many more than 5 stars. From getting the estimate to the installation, the process was seamless. Ollie is a true professional and his crew is fast and efficient. Ollie explained the process, provided a reasonable estimate and answered any and all questions to my complete satisfaction. It is my sincere pleasure to recommend 5-Star Roofing and Ollie Rowe!!! We love our new roof and 5 Star Roofing did an amazing job. we couldnt be happier with the professional and friendly service we received from 5 Star Roofing! Efficient, courteous, prompt, thorough - did a great job with complete cleanup. Very happy and satisfied with the results. Definitely recommend. Very impressed with Mr. Ollie Rowe and his 5 Star Roofing Co. Our expectations were met or exceeded in all areas of the job. Timely quote, recommendations explained, top quality material and excellent workmanship . Very pleased with the results. Ollie Rowe and his team recently replaced our roof which was damaged by a hail storm. They did a wonderful job. The roof looks great, they cleaned up thoroughly before they left and Ollie was actually on the job site the entire day making sure everything was done correctly, and I really appreciated that. I would highly recommend them and would use them again. Completely satisfied with the work performed by 5 Star roofing. They arrived on time and completed the roof replacement in a very timely manner. The new roof looks great and my wife and I are very happy. They cleaned up all the old materials better than expected. I highly recommend this company for any and all roof work. The best experience I have ever had with a contractor. The work was amazing as well as the communication before the job started. He shows up quickly and will give you a detailed, well laid out cost of all materials and labor. Despite being the owner of the company - he showed up first and was the last to leave the job site. The cleanup was excellent. The copper flashing put around the chimney was done correctly and looks wonderful. The price quoted and paid fell into the range expected for the quality of materials and time spent on the job. Ollie Rowe and 5 Star Roofing, re-roofed our 20 year old house the summer of 2016. I could not have had a better customer experience. Ollie inspected my roof, then came back and met my insurance adjuster, with no guarantee of the job. When I gave him the go ahead on Thursday, he had my roof torn off and roofed by Saturday at 3:30pm! At every step in the process Ollie produced. The price was competitive and fair, workmanship was excellent, follow-up was top notch. After Ollie's crew had cleaned up and left, he remained and continued to run the magnet to pick up any stray nails in my yard. I would recommend Ollie and 5 Star Roofing to anyone interested In high quality product and a great customer experience. Overall the best experience I've had with a contractor. Ollie Rowe was professional, timely, and most importantly, true to his word. He was in contact with me throughout the process and very helpful in dealing with my insurance. Plus, I have a beautiful new roof! 5 Star Roofing are very professional and have done an exceptional job. Completion was fast and clean. Already received several comments from friends and neighbors. Thanks again to Ollie Rowe and team. When's the worst time to discover you need a new roof? When your house is for sale and you've accepted an offer. Who is the best person to call? Ollie and 5 Star. He even spoke with me while he was vacation. Don't waste time calling another roofing contractor; Ollie and his crew are simply the best. If you'd like to contact any of our customers for a reference, we'd love to get you in touch with them.